hermod wrote: Further information about Hitler's secretary Traudl Junge and her ignorance concerning the Big H until after WW2. Good find, I know an elderly Austrian whose parents married in a concentration camp - They also didn't know anything about "the Holocaust" . So are there many "Nazis" who were there, but didn't notice anything. Seems the Holocaust is basically a conspiracy theory. BERLIN (AP) — During Traudl Junge's three years as one of Adolf Hitler's secretaries, most of Europe's Jews died at the hands of the Nazis and World War II was at its height. In a new documentary, Junge, now an ailing 81-year-old, admits she was taken with the magnetic power of Hitler when, at 22, she applied for the job. It was only after the war, when she learned what many already knew, that she felt wracked with guilt for having liked the "greatest criminal who ever lived." Rabbi Marvin Hier, dean and founder of the Nazi watchdog group the Simon Wiesenthal Center, called Junge's recollections "sheer fantasy." "In the history of the Third Reich the argument is always the same among those in the close circle around Hitler. They never heard the horrible things. That is all basically revisionism,' he said. "Blind Spot: Hitler's Secretary," presented this week at the Berlin International Film Festival, shows an elegant, white-haired Junge lucidly recalling in an interview in her one-room Munich apartment the events more than 50 years ago. Another Wiesenthal Center officials said Junge's gullibility was symptomatic of attitudes in Germany during Hitler's rule. "The important thing here is not whether she knew what was happening or heard it mentioned. Those crimes were definitely committed. Her story reflects the blind loyalty of far too many Germans whose allegiance to Hitler and the Nazi party enabled the implementation of the final solution," said Efraim Zuroff, director of the Israeli office of the Wiesenthal Center. Austrian director Andre Heller culled 10 hours of interviews for the 90-minute film, in which Junge insists she was insulated from the Nazi terror despite having close contact to Hitler, held responsible for the deaths of 6 million Jews in the Holocaust. Hitler and other Nazi leaders "practically never mentioned the word Jew" during scores of meetings she attended, Junge said. Instead, she recalls life in Hitler's inner circle as a "harmless and peaceful atmosphere" — except during the chaotic final days when the Red Army moved in on his Berlin bunker and Hitler committed suicide on April 30, 1945. As Hitler faced Germany's defeat, the illusion was shattered. "He said it was all over," said Junge. Two days before Hitler and his longtime mistress Eva Braun killed themselves, as the bunker shook with the explosions of shells from advancing Soviet troops, Hitler asked Junge to take down his last will and testament. Throughout her time with Hitler, Junge says she never heard Nazi leaders discussing Jews or the Holocaust. "I never had the feeling that he was consciously following criminal aims," she said. "No one ever spoke about this topic — at least not in our presence," she said. As the Third Reich collapsed in the spring of 1945, Hitler sat for long periods of time just staring into the distance. There were no longer regular meals. "Everything took place so unceremoniously," said Junge. "People even began to smoke in Hitler's presence." "It was a terrible time. I can't really remember my feelings," she said. "We were all in a state of shock, like machines. It was an eerie atmosphere." Junge recalls Hitler as "a pleasant older gentleman, friendly, with a soft voice," — much different from what she had expected from seeing his speeches on film. By the end of the war, Hitler's words and actions convinced Junge he was losing touch with reality. Once he remarked to her that it would be too risky for him to have children, saying "the children of geniuses are sometimes cretins." The assistant to Rudolf Hoess himself at Auschwitz-Birkenau, Joseph Kramer, who was allegedly "in charge of the gas chambers" at Auschwitz-Birkenau from May to December 1944, first denying the existence of gas chambers and mass murders at Auschwitz-Birkenau, is that a Nazi "Holocaust denier" prominent enough for Mr O'Neill? Johann Breyer, 89, had successfully eluded a dark past that allegedly included the extermination of hundreds of thousands of people according to prosecutors. Breyer, known as “Hans,” was arrested Tuesday and charged with serving as more than just a perimeter guard at the notorious Auschwitz camp where more than one million people — most of them Jews — were killed during World War II. He maintained that he never persecuted anyone reported CNN. The German government alleges that Breyer served in the Nazi “Death’s Head Guard Battalion” from 1943 to 1945 at Auschwitz and another location according to court papers. They have charged Breyer with complicity in the murder of more than 216,000 Jews from Hungary, Germany, and Czechoslovakia who were deported to Auschwitz in southern Poland on 158 trains. The Germans have asked him to be extradited. Last edited by hermod on Fri Jun 27, 2014 8:46 pm, edited 1 time in total. The case is already a bit older. He says he was drafted into the Nazi SS against his will. He says he merely guarded the perimeter of Auschwitz and Buchenwald, and knew nothing of the death factories. But historians say Johann Breyer, the amiable tool and diemaker known to his Northeast Philadelphia neighbors as Hans, must be wrong. Breyer, 66, was alleged to be a member of the Death's Head Battalion, a division of the SS that guarded concentration camps, in a lawsuit filed here Tuesday by the U.S. Justice Department. He said in an interview Tuesday that he had "not the slightest idea, never, never, ever. All I know is from the television. What was happening at the camps, it never came up at that time, guarding the whole area. For me it was 12-hours-long duty." The Holocaust experts derided Breyer's statement as "preposterous" and ''incredible." They say the Waffen SS was almost exclusively a volunteer organization when Breyer joined in February 1943. He may have been one of many who chose the SS to avoid the bloody Eastern Front, one scholar said. "You could smell the stench of bodies for miles, to such an extent that residents in neighboring villages couldn't help but know," said Aaron Breitbart, senior researcher for the Simon Wiesenthal Center for Holocaust Studies, in Los Angeles. "You see people going in all the time and the camp doesn't get any bigger. On a windy day you could see the smoke from the crematoria chimneys." The suit seeks to revoke Breyer's American citizenship, claiming that he entered the U.S. illegally in 1952 by lying to immigration officials and hiding his death-camp service. He is not charged with war crimes. The federal court will decide only whether he told U.S. immigration officials the truth 40 years ago. Breyer has declined requests for interviews since Tuesday night, when he said immigration officials asked him only whether he'd fought against American troops. He said he was a victim of the war. Breyer, a grandfather who retired earlier this month after 32 years with the same company, said it's wrong for the government to come after him now for his actions as a 17-year-old in World War II. And he has received support for that view from those who know him. "I don't believe the charges," said an employee who worked alongside Breyer for 23 years at Laneko Engineering Co. in Fort Washington. "He was always a quiet and gentle man, never radical. So what if he was a guard? What's the difference between that and an American soldier guarding a POW camp?" Breyer's neighbors in the Northeast Philadelphia area of Ashton-Wooden Bridge, expressed surprise at the Justice Department's lawsuit. They told of a friendly, hard-working fellow who liked to tend his lawn and barbecue in his backyard. They had only kind words for him. "I'm as shocked as I can be," said James Flanagan, who has lived next door for four years. "It's a nice neighborhood and he was a nice neighbor. He still is." The Justice Department says Breyer is one of more than 500 former Nazis living quietly in the United States who may have to face a day of reckoning for their participation in the Holocaust. "At the Auschwitz death camp," the lawsuit contends, "the duties of an armed guard such as (Breyer) included guarding prisoners to ensure that they performed slave labor and did not escape . . ., escorting prisoners to and from such work details, and guarding prisoners from watchtowers and the perimeter of the camp," the Justice Department contends. At Auschwitz, in central Poland, two million people, mostly Jews, perished in several camps. One of them, Birkenau, was an extermination camp with gas chambers that killed hundreds a day, particularly women, children and the elderly unable to work. The smokestacks from its crematorium dominated the landscape. Breyer is accused of guard service at Auschwitz from October 1944 until January 1945 - a period, the Justice Department complaint stated, in which 60,000 people died. Before that, from February 1943 until September or October 1944, he had served as a guard at Buchenwald in Germany. As an ethnic German in Slovakia, a nominally independent state under German control, Breyer would have had the option of avoiding compulsory military service by voluntarily enlisting in the Waffen SS, said historian Raoul Hilberg yesterday. The SS was overwhelmingly a volunteer organization, said Gerhard Weinberg, a professor of German military and diplomatic history at University of North Carolina at Chapel Hill. The SS drafted some members late in the war, but according to Weinberg and Hilberg, compulsory service did not begin until 1944. "He made choices," said Hilberg, a professor of political science and international relations at the University of Vermont, and author of the three- volume work, The Destruction of the European Jews. "He could not have been utterly ignorant of what the SS was, and what it stood for. You could put in for transfer to a fighting unit. A lot of cowards found some other option." I highlighted a few things, but I think there are more gems. Now what, if he's right? He didn't know, because he couldn't know, because "it" simply didn't happen. Hektor wrote: The case is already a bit older. Aaron Breitbart, senior researcher for the Simon Wiesenthal Center for Holocaust Studies, in Los Angeles. "You see people going in all the time and the camp doesn't get any bigger. On a windy day you could see the smoke from the crematoria chimneys." "You see people going in all the time and the camp doesn't get any bigger"
Did that researcher ignore that Auschwitz, at the former "Corner of Three Empires", was a large railway hub with many inmates dispatched to other labor camps from there, or was he deliberately lying? "On a windy day you could see the smoke from the crematoria chimneys"
There are crematories not far from my home. Must I call the police? "There are crematories not far from my home. Must I call the police? " No, Hermod.....you should call the Simon Wiesenthal Center..... it's probably a bunch of "Nazis" running that place! Can you smell the burning flesh from your house?.....can you see the smoke and flames? "You see people going in all the time and the camp doesn't get any bigger. On a windy day you could see the smoke from the crematoria chimneys." This from the official auschwitz web site. The basis for Auschwitz consisted of 22 prewar brick barracks buildings. Over time, the camp expanded steadily in both organizational and spatial terms. At its peak in the summer of 1944, Auschwitz covered about 40 sq. km. in the core area, and more than 40 branch camps dispersed within a radius of several hundred kilometers. At this time, there were about 135 thousand people (105 thousand registered prisoners and about 30 thousand unregistered) in the Auschwitz complex, which accounted for 25% of all the people in the entire concentration camp system. There, it took me less than five minutes to find out that the camp didn't appear overnight, all finished and shiny, but was built and then expanded over a period of a few years and covered a whopping 40sq km! So how would he be expected to know what was happening in every part to every inmate. Additionally as we now know from the good work done by the boys at the web site http://www.whatreallyhappened.info, auschwitz had a huge movement of inmates in and out. Therefore most of what he said he knew and didn't know stands up in the real world, sadly the SWC and the holocaust management team don't live in the real world and don't want you to either. OK. I'll do that. And I'll photoshop a picture to strenghten my case. I can smell roast chicken 24 hours a day. So I eat only fish and pork meat now. I can't take it anymore! FRITZSCHE: Yes, the fact of their creation was announced publicly, I believe in 1933; and the concentration camps were mentioned later in official communiquÃ©s. Hektor wrote: So it gets even better! Ich habe noch eine andere Frage an den Angeklagten Mulka. Sie haben nun gehört, daß zu der Zeit, als Sie Adjutant waren, in Birkenau die zur Vergasung bestimmten Menschen mit Lastkraftwagen zu den Gaskammern gefahren wurden. Haben Sie davon gewußt? Nein, ich meine nicht Sie. Ich meine hier den Angeklagten Mulka. Ich habe die Zeit nicht verstanden, die der Herr Zeuge genannt hat. Zu welcher Zeit war das? Das war im Sommer 1942. Die Zeit spielt ja auch so in dieser Frage keine Rolle. Doch, ja, die Zeit spielt eine Rolle. Davon bekam ich keine Kenntnis. Und wie können Sie erklären, daß Ihnen das verheimlicht worden ist? Nachdem Sie das heute alles erst erfahren? Es lag keine Veranlassung vor, da ich mit Schutzhaftlager und Häftlingen nichts zu tun hatte. Das ist ja eine Sache der Vergasung gewesen, und die hat mit dem Schutzhaftlager doch wohl kaum etwas zu tun gehabt. Ich hatte auch mit Vergasungen nichts zu tun, Herr Staatsanwalt. Ich frage, ob Sie es gewußt haben. Ich frage nicht, ob Sie etwas damit zu tun hatten. Ich frage, ob Sie es gewußt haben. Ich bekam keine Kenntnis davon, insoweit habe ich es nicht gewußt. Sie wollen also sagen, Sie haben damals, als Sie Adjutant waren, nicht gewußt, daß die Lastkraftwagen eingesetzt wurden, um die zur Vergasung Bestimmten zu den Gaskammern zu transportieren? Nein, man fragte mich nicht danach. Sie haben es nicht gewußt, wollen Sie sagen? There you have it, even after several question the accused former adjutant Mulka denies any knowledge of homicidal gassings. 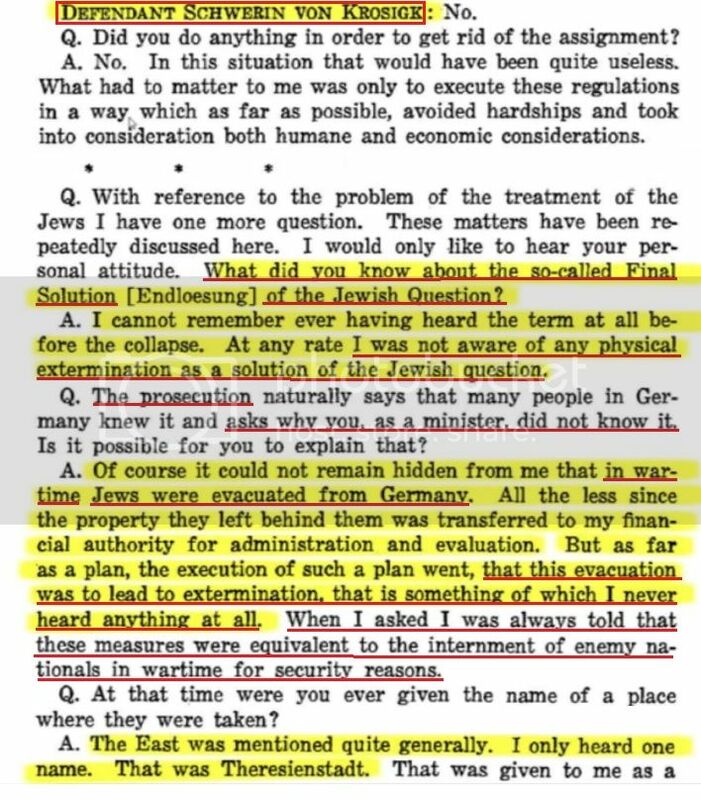 At Nuremberg, after WW2, Germany's Minister of Finance Schwerin von Krozigk (who was even offered to become Germany's Chancellor after Hitler's death, but declined the offer) also denied any knowledge of a physical extermination of Europe's Jews by Nazi Germany. hermod wrote: At Nuremberg, after WW2, Germany's Minister of Finance Schwerin von Krozigk (who was even offered to become Germany's Chancellor after Hitler's death, but declined the offer) also denied any knowledge of a physical extermination of Europe's Jews by Nazi Germany. Interesting, is that somewhere on the avalon project or zeno.org? * Those that, just like Count Schwerin didn't hear about anything. Hektor wrote: Interesting, is that somewhere on the avalon project or zeno.org? I don't think so. You can find it in the IMT's Green Series (part XIII, p. 406). 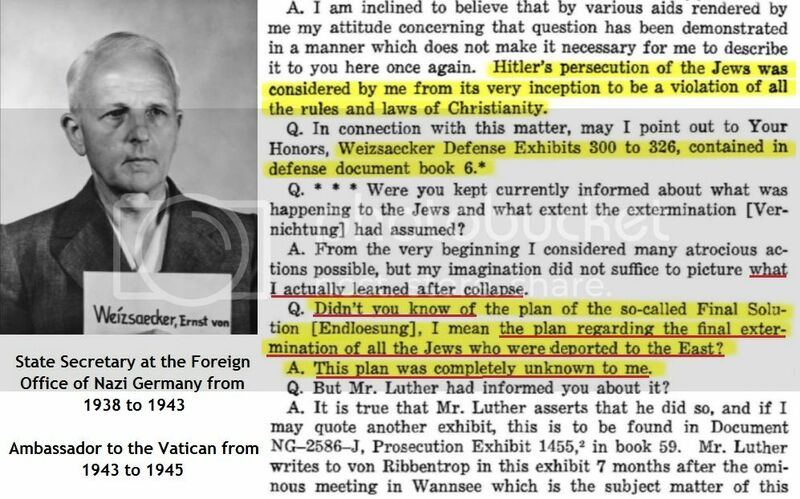 Ernst Weizsäcker (who was opposed to anti-Jewish persecutions), the number 2 of the German Foreign Office from 1938 to 1943, knew nothing of the Big H before the Nuremberg "lynching party". 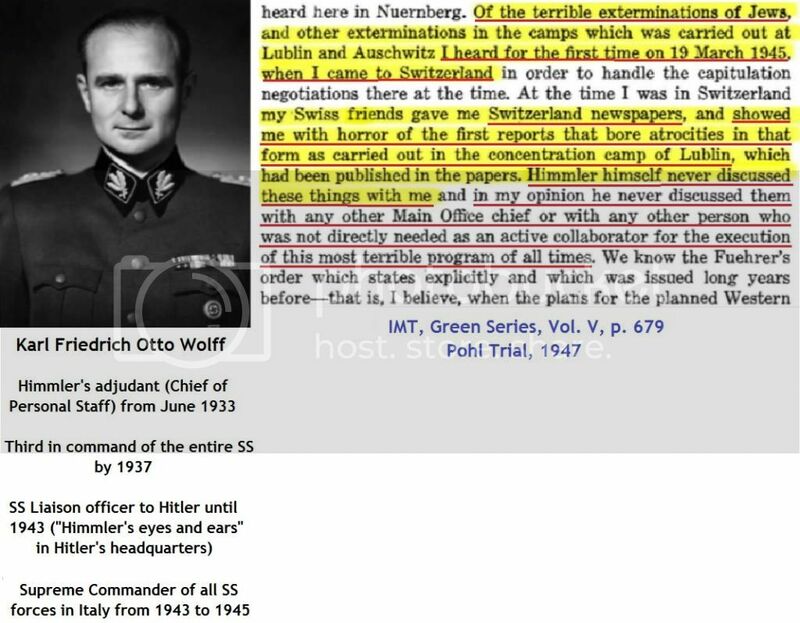 And Karl Wolff, the Liaison officer between Himmler and Hitler, first heard of the extermination of Jews in March 1945, from the Soviet 'report' about the Majdanek "death factory" in Swiss newspapers.